If you are looking for a solid performing set of cables for your gadgets, give this 6-pack a look. They are great performers, can handle a wear and tear and lets face it, we always need an extra cable – or three. Wisely, the company includes four of the most likely-to-be-used length cables. I find that the 3.3′ cables work for just about every need while the 6.6′ cable is great for my desk areas where I can tuck the extra length in the back of my desk while being able to safely lift up my phone with it connected to my phone. This longer cables also comes with a Velcro tie to keep it bundled up when you don’t need all that length. The smaller cable is excellent for connecting your phone to a portable battery pack. Construction wise, the individual wires are sleeved, then shielded then wrapped in the hard but flexible rubberized coating. That coating slides under the housing for the actual connectors so they will withstand the constant pulling of being unplugged without becoming exposed. I’ve been using several of these cables for the past few weeks both at home and on the road where they have been bent, wrapped up and twisted numerous times. While I appreciate that a month is not a true indicator, I’ve seen no signs of wear and tear on any of the cables nor on the connectors themselves. Like other accessories from Choetech, these cables are backed by an 18 month warranty which also provides a bit of comfort knowing the company will be there to support you should a cable break. 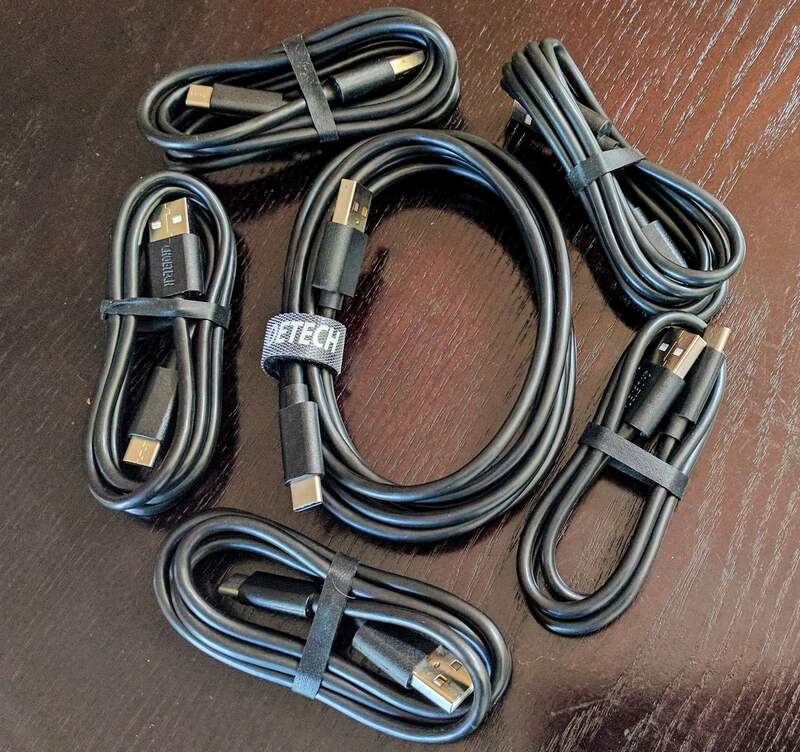 The Choetech USB-C to USB-A 6-Pack that I’ve reviewed is $15.49 and available through the company’s Amazon storefront. If you want the USB-C to USB-C 6-Pack, that is $19.99 from their Amazon Store.